been out yesterday , blowing a hoolie then the rain started , not a sniff short session....... just was not feeling it on that particular venue. I think it's getting warmer next week so the fishing should be better but catching a twenty is still big ask but if anyone can do it you can. Good luck. I don't know where to go next - am waiting for inspiration. 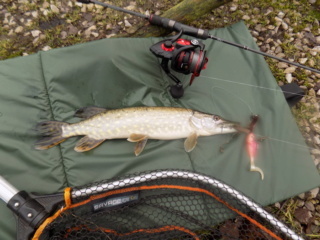 psion wrote: I think it's getting warmer next week so the fishing should be better but catching a twenty is still big ask but if anyone can do it you can. Good luck. We were out yesterday the weather was bad, very windy. I blanked again but my mate had a Jack so he was happy. I am planning a trip to Scotland next week so hoping for better luck. 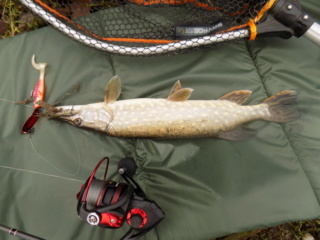 I had my first trip this Pike season to a North Wales venue yesterday that I've fished many times over the last 10 years, I have been a member of the club for the last few seasons but with me concentrating on other venues this season, hadn't bothered making the 150mile round trip this season. I was down there for 1st light and on the drive down I was trying to decide which swim I'd opt for with me having two areas in mind, one of which involved a decent walk. I've been hearing odd rumours of a couple of big fish from here this season which is good to hear after several years in decline. As it was I opted for the easier of the two swims I had in mind as the light wind was pushing diagonally into this bank. 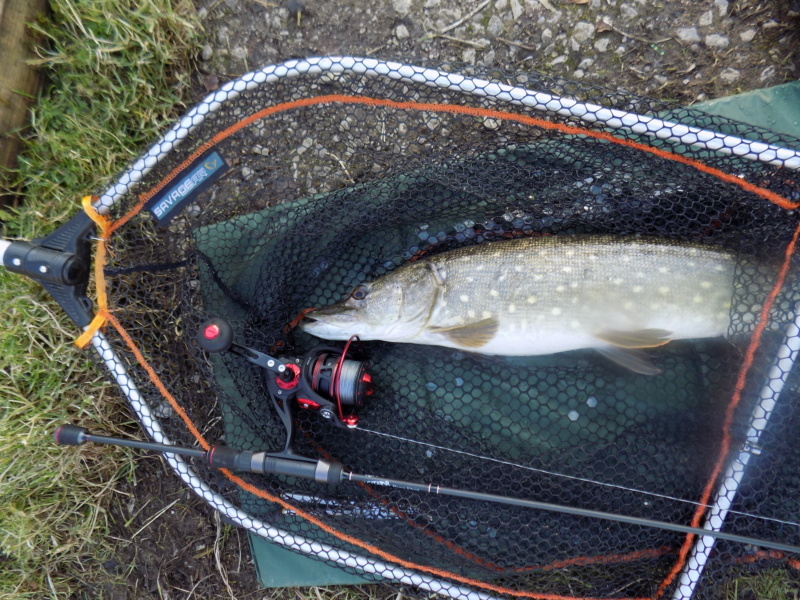 I had 3 rods out on Lamprey, Sardine and a big section of Eel before it got properly light. 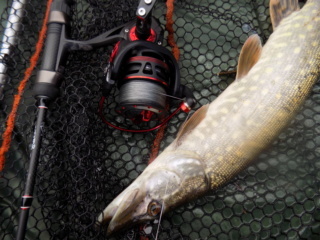 My first run came at just after 08:30 and my run of 7 consecutive blanks was over, not the biggest fish I've caught, but at 8Lbs 6oz it was more than welcome. I had to wait until 11:25 for my next chance and this was a better fish at 12Lbs 5oz which was a really long and young looking fish that bodes well for the future on here. 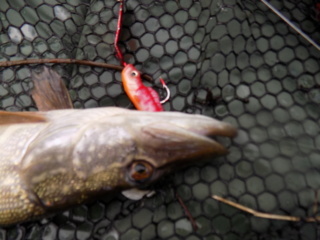 I then proceeded to suffer a couple of hook pulls on the next 2 runs, one of which felt a decent size. I then banked a couple more at 7Lbs 6oz and a small Jack about 5Lbs that disappointingly had another trace and set of trebles down it's stomach. 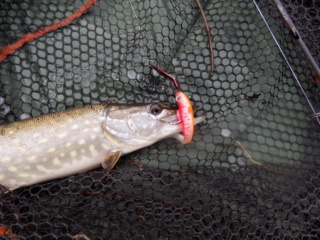 I managed to get the hooks out but it took some doing so I rested it in the margins before it swam off. I'd caught this hard North Wales water on one of it's better days and was relieved to start catching again after my run of blanks. 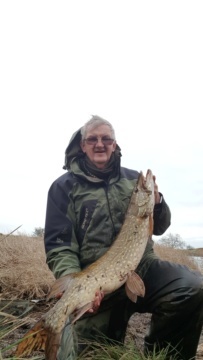 David Wynne wrote: I had my first trip this Pike season to a North Wales venue yesterday that I've fished many times over the last 10 years, I have been a member of the club for the last few seasons but with me concentrating on other venues this season, hadn't bothered making the 150mile round trip this season. I was down there for 1st light and on the drive down I was trying to decide which swim I'd opt for with me having two areas in mind, one of which involved a decent walk. I've been hearing odd rumours of a couple of big fish from here this season which is good to hear after several years in decline. 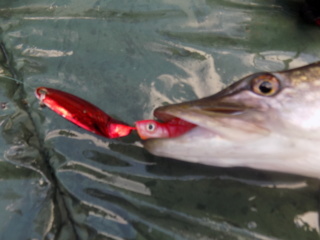 The fish that had the trace down it's throat looked like it'd been deep hooked and instead of trying to remove it, they'd basically cut the line leaving the whole trace and hooks trailing out of the fish and just returned it, probably thinking that it'll survive. Hopefully there are the odd signs of it making a slow comeback. There was a couple of lads further round past the bay and through the gate on another productive swim They were bailiffs of a large North West club I'm in, who had travelled over a 100 miles each way from the Macclesfield area to fish here. I didn't quiz them about what they heard about the place but they headed straight for the area I'd mentioned and you don't travel that far unless you hear or know something. 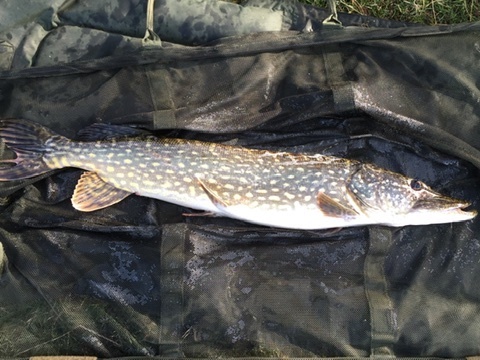 I spoke to them as they were packed up and heading back to the car and they'd had a 16Lbs 4oz fish and a couple of Jacks all taken fairly close in. 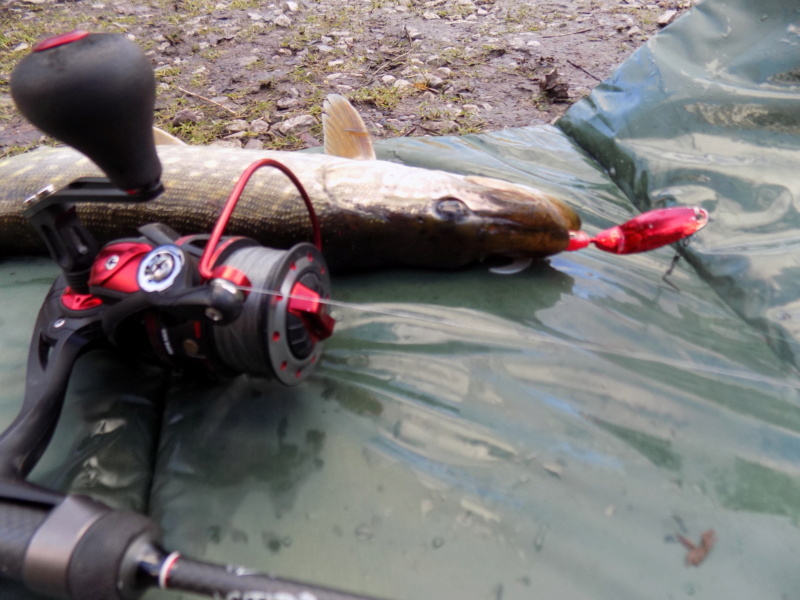 Worryingly there has been a few youtube videos made by a couple of so called Pike anglers which although not naming the water it's easy to recognise where it is.